In the darkest moments of life, everyone needs someone to lean on, someone who will listen. 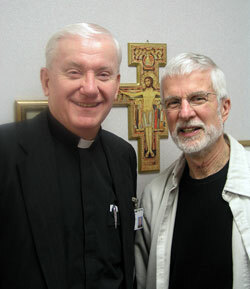 So it was for Father John Mannion as he left the room of a 21-year-old patient at St. Francis Hospital in Beech Grove. For weeks in his role as a hospital chaplain, Father Mannion stopped by the room of the young man who had AIDS. During his visits, the priest saw the young man dying. He also listened to the mother of the young man as she talked about her only child. In the woman’s words and tears, Father Mannion knew that the young man was his mother’s life and her greatest love. It was a time of suffering and anguish for the son and his mother. It was a time of heartbreak and struggle for Father Mannion as he tried to comfort both of them. When the young man died, Father Mannion left the hospital room devastated. The priest who had cared for so many people needed someone who could comfort and counsel him. Friendships can start with a common interest in almost anything—playing sports, dancing, sewing, parenting, fixing cars, collecting stamps or sharing faith and compassion with people in the most vulnerable moments of life. Ever since Crouter and Father Mannion started as chaplains at St. Francis Hospital in the summer of 1988, they have shared a bond that has continued to grow and deepen. Now, after nearly 22 years of working together in the hospital’s department of spiritual care, the two friends—who are both 68—have decided it’s time to cut back dramatically on their pastoral care for hospital patients. Father Mannion will leave his post as the director of spiritual care at St. Francis Hospital to take up a lighter schedule as a priest-on-call who will continue to offer sacraments to patients. Crouter will step down as a full-time chaplain and fill in on nights and weekends when needed. The friends will be honored in a celebration at the hospital on March 26, a celebration that will also honor two chaplains who are retiring—Father Ruta Cabazi and Annette Barnes. For Crouter and Father Mannion—and everyone who knows the two friends—the March 26 event will be a time to celebrate and reminisce about the kind of friendship that most people hope for, a friendship that even thrived following a moment that could have damaged or destroyed a similar relationship. That moment occurred 12 years ago when St. Francis Hospital administrators approached Father Mannion about becoming the director of spiritual care. In deference to Crouter, who had been hired at the hospital a month before Father Mannion, the priest asked his friend if he was interested in becoming director. Crouter told him he wasn’t because he preferred to stay in close contact with patients and their families. Then came the potentially divisive moment. In the department of spiritual care at St. Francis, the chaplains vote on the hiring of any employee, including the director. There were 10 chaplains when a vote was taken about Father Mannion becoming the director. Only one chaplain voted against him—Crouter. “I told him, ‘John, you and I are friends. If there’s something I fail to do or do poorly, you won’t confront or correct me if you’re the director,’ ” Crouter says, recalling the reason for his vote. “That’s come true a number of times over the past 12 years. One quality that marks the deepest friendships is trust. Sometimes, that trust gets expressed in words. Often, it’s displayed in actions. Father Mannion has placed Crouter in charge of his estate. The priest has also put his close friend’s name on his checking account and his savings account. Sitting nearby, Crouter isn’t surprised by his friend’s praise. He has heard it before; he cherishes it still. He describes Father Mannion as “a person who will do anything for you,” including baking a cake for the people he loves and the hospital staff members he admires and respects. shut-ins of his small, rural parish, he also brought them their favorite dessert—having spent the previous night in the kitchen, making cinnamon rolls, chocolate cake, and lemon, cherry and apple pies. They do share certain gifts, according to the woman who may know them best. Yet, 22 years ago, their friendship didn’t seem destined to become so special. When Father Mannion interviewed for a chaplaincy position at St. Francis in 1988, the Franciscan sister doing the hiring confided to him that she hoped she had done the right thing when she hired a Protestant—Crouter—as a chaplain just a short while earlier. Their nearly 22 years of offering spiritual care to patients, families and hospital workers have also created a lasting impression on their approach to faith. Crouter was present when Father Mannion baptized one of Crouter’s grandchildren, Colette, as she entered the Catholic Church eight years ago. He also believes that Father Mannion continues to be one of the great fellow travelers on that journey. “He’s the extrovert, I’m the introvert,” Crouter says. “He’s just out there for people. It’s effortless for him. Sometimes my evil side says I’m envious of him. But my good self has been invited and inspired to be the way he is. He’s made me share more openly the things I’ve felt. He reminds me of my vulnerable side, and I remind him of his strong side. That’s why we’re good for each other.